It was the birthplace of our most ambitious artistic musical phase. At the Chamber we developed our music into a multi-media event and worked to make every show a new opportunity to create an interesting and memorable concert with an “in the round” feel, up close and personal. It was raw, and not over-produced. You could hear and see the music the way we wrote it and played it. All-in-all we performed 12 shows at the Chamber. We stated in 1984 not long after Gerry moved into a flat on the other side of the building with Jim Couch (Guitarist for the Factor, Future History and Camouflage). Both of those guys were working at Tops, which was about 100 yards away on the same side of the street. Our first show at the Chamber began on May 26, 1984. It was spring time and we had been rehearsing our new original songs for about seven months now. The last member in was Billy Simms who joined the band to play keyboards in March of 1984. Billy heard our Loft Studio recording of “People’s Court” and ever since wanted to be part of the band. By May, we were ready to give it a trial run in front of an audience. We started nice and easy and invited close fiends and family to start us off. We had family helping us with sound and lighting like Keith Huels and Barry Cannizzaro. Your formal invitation, so dress appropriately! We learned from the last show and decided to make a few tweaks to the over all show. We worked hard on creating an interesting stage presentation and transformed the back wall behind us to a cyclorama of art. That took us a couple of months and now it was time to try it again, this time expanding our invites to everyone who wanted to party and see a live show. In the city of Buffalo and Kenmore that meant about everyone between the age of 13 and 45! Parousia backdrop 1986, Courtesy of Kim Montesano of Viv’s Fabrics, asks the timeless question – – Yes? This was our third concert party at the Chamber. We were getting the hang of it by now… free beer, free food and live music was the winning combination for our friends and fans. We finished mastering the Keep Running video in October and began distributing copies in November. We decided to have our video release party in December when people we knew (like Gregg Filippone, the producer) were visiting Buffalo for Christmas. We had a fine gathering of family, friends and well wishers at this event and after a special live performance of select Parousia songs we played the video. Garth posing for some sort of post-glam look! After Over a Year of Performances in Other Venues, Parousia Returns to The CHAMBER 04.26.1986 with their Exclusive Momentum Show! We took a year off from putting on these shows at the Chamber to take our show on the road. We played at Broadway Joe’s on Main Street in Buffalo and then Plant 6 on Delaware in Kenmore. That helped build our audience in both cities and we were attracting a lot of fans with our specialty themed shows and original music. Now that spring was here, we figured it was a perfect time to start up again with our local concerts at the Chamber which is right on the border of both Buffalo and Kenmore, the perfect location for our current fan base. This particular evening was a great show… our all-age music concerts at the Chamber were becoming quite the popular event in the neighborhood. Was it the loud rock music, the catchy tunes or the free beer? I’m not sure, but we pulled in over 150 people this night. The place was literally packed down into the parking lot! I’m not sure who thought of the idea to hire off-duty cops as security for our shows, but that move really paid-off and helped keep the Buffalo and Kenmore police off our backs each time we played. We have nine videos from this one show thanks to the covert film work of Tom Martin, a good friend and fan. The success of our first Chamber show in 1986 sent a message loud-and-clear throughout the neighborhood. And that message was that the Chamber was the place to party for gals and guys of all ages without worry. As a result, our second show in 1986 was even bigger than the last. Over 200 people showed up for this gig. The Chamber was packed to capacity and the parking lot was full of people. We had off-duty police men as security, patrolling the grounds which kept the on-duty officers off our back and from breaking up the show. I was looking forward to this show. My roommate Jim Couch’s new band Camouflage was going to perform as the opening act. Jim knew a lot of people and most of them were at this show. At this point we were still calling it the “Rock Chamber”, but starting with the next show we dropped the “rock” henceforth to be known simply as “The Chamber”. Jim Couch and Camouflage with Ed Wasilowski & Rob B. The name of this particular party at the Chamber was called the “OOG VOT” party as a kind of an experiment. We called it that because of the oversized letters that would sit across the front of my drum platform. We would use the letters to spell out crazy words at shows and change it every now and again. Throughout the last couple of shows, the letters for what ever reason spelled out the word “VOGNU”. Well, I guess some people thought that “VOGNU” was the name of our band because as we were performing people would shout out, “Vognu… yeah!” For this show we decided to use the letters to spell out “OOG VOT” to see if anyone shouted out… “OOG VOT rocks! This was our twelfth and final show at the Chamber. We had a great send off crowd. After this, we were set to move out and store all of our equipment at a facility called “Ultimate Storage” on Delaware and Kenmore until our big move to Hollywood California in January 1987. 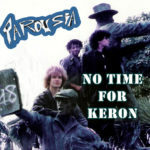 After Parousia moved to the West Coast we rehearsed, recorded and performed there for another six years up until 1992. What was next for Parousia? Stick around and find out….